I thought this was a plastic model in 1984. When I was ten years old the world was a VERY different place. It was 1984 and The Last Starfighter was the pinnacle of computer graphics. Watching that movie as a ten year old kid I had no idea at all that the outer space scenes were rendered on a Cray supercomputer. If I watch the movie now it’s very obvious that the spacecraft and battles are CGI, but in the early 80’s we had never seen anything like that before and so assumed that these were the same type of plastic models used in Buck Rogers and Star Wars. We 80’s kids had dreams of the future, but they weren’t what you might think they were because they were based on what we knew. I was sure I’d have a personal robot. 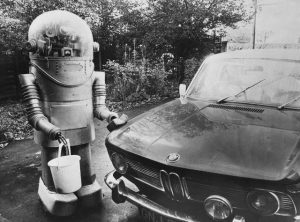 Young me would often imagine the year 2000 (two-thousand) as a time when I would have a personal helper robot and be able to visit a Hilton hotel on the moon. I thought sure that I would get to the moon on a Pan Am or TWA rocket, and that when I got there I would break out my portable suitcase computer. If I imagined myself as being pretty rich in the year 2000 (and I did), I would assume that I might have a telephone in my car, or perhaps in my briefcase. I was pretty sure there would be flying cars and that i would be eating food that was more like astronaut food that could be expanded into real food with warm water. Monorails, I thought that the city of Los Angeles, where I still live, would have a monorail system that resembled the one in Disney Land or at least a PeopleMover. I thought future cities would look like Disney Tomorrow Land. Yes, my 80’s kid view of the future was almost nothing like it turned out to be–because now I live in the future and the next future is the new future that I’m sure I’m imagining just as wrong as I imagined the future back then. My ten year old self never imagined anything like the internet, touch screens, mobile devices, or flat screen TVs. My future was the advancement of technology I could see and understand. 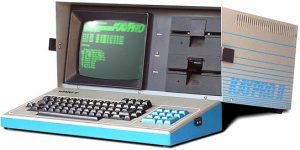 This is what I thought my portable computer would be like. In some ways I feel like I’m still waiting for a future that will never happen. Someplace deep down I still hold out hope for that PeopleMover or for that Moon trip. While I’m amazed, and generally happy, about how technology–especially computer technology–turned out, that little piece of me that wanted a personal robot butler or a future version of the C64 is just a little disappointed. I miss the days when you weren’t glued to a global information network. I miss when you could say you weren’t home to take a phone call. I miss the days when I couldn’t tell the difference between a plastic model and CG. 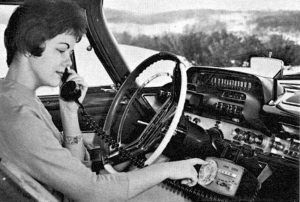 I dreamed of a phone in my car that looked something like this. That little pang of nostalgia is why I Retropute.